This is a simple voltmeter which measures 0-5V at a precision of 4.8 mV. This is a simple design using inbuilt ADC of PIC 16F877A. PIC 16F877A have 8 channel 10bit ADC. Measured voltage is displayed on 16x2 LCD display. 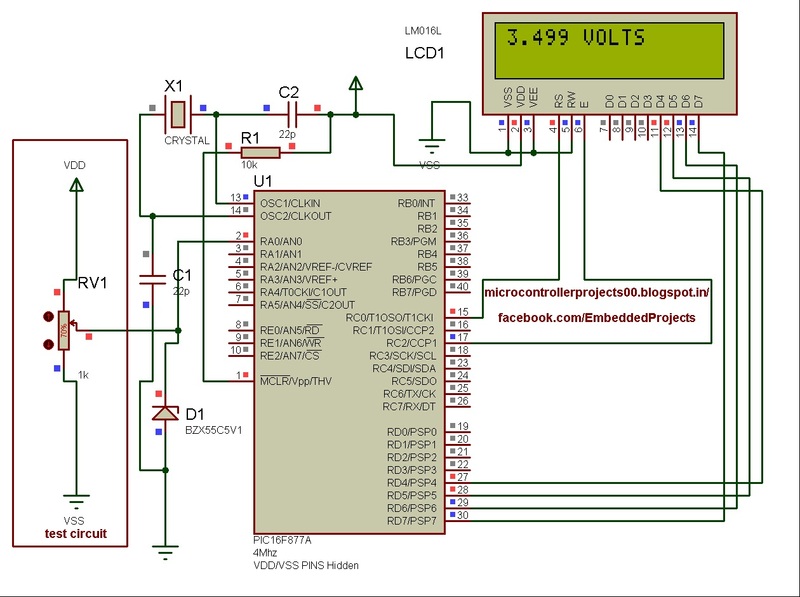 - bits 3, 4 and 5 are used to select the pins of the microcontroller enabled to theadc conversions. ADC module of PIC Microcontroller converts the Signals on its analog pin to 10 bit binary data and it has software selectable high and low voltage reference input to some combination of VDD, VSS, RA2 and RA3. The analog input to PIC is limited to 0 to 5.The converted value is in mV. It is then converted to volts and displayed on LCD. May I know which software you used to draw circuit and simulation? I dont know Hindi well please write in English. If the reading shown is 0.000 make sure that the program enter in do-While Loop, make sure ADC config is correct, and make sure ADC read something. Nice information.Generally in College final year projects, Digital Voltmeter is used to measure voltage. 8051 voltmeter and A/D converter are the main components of the digital voltmeter. The circuit diagram clearly depicts the concept of signal conversion through PIC Microcontroller.